photo-eye Gallery From Local Eight: Works by Steve Fitch and Edward Ranney Represented artists Steve Fitch and Edward Ranney share insights about their process as well as some behind-the-photo stories for two works included in photo-eye Gallery's group exhibition LOCAL EIGHT – on view at photo-eye Gallery through Saturday, April 22nd. 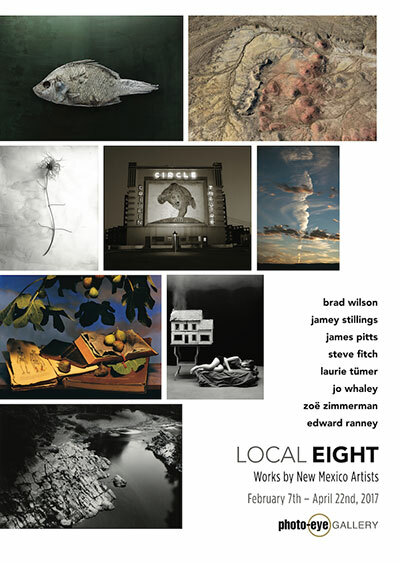 photo-eye Gallery's current exhibition LOCAL EIGHT features a diverse selection of works from a passionate community of represented artists living in Nothern New Mexico. Even though Steve Fitch and Edward Ranney, two of the eight photographers featured in LOCAL EIGHT, both create anthropologically-based landscape images using large-format cameras their fundamentals, intentions, and experience are wildly different. Ranney's images are distanced and lyrical observations primarily focused around humanity's impact on the natural world, while Fitch trains his keen and detailed eye on the eccentricities within an environment people make for themselves. Both sets of prints are beautiful and fascinating. photo-eye Gallery is excited to share insights from both Ranney and Fitch about their process as well as some behind-the-photo information for a couple of the works included in LOCAL EIGHT – on view at photo-eye Gallery through Saturday, April 22nd. "In 1972 after I had been making pictures along the highway for about a year I reflected upon all the pictures that I had made so far and realized that something was missing. I had photographed tourists, truck stops, motels, billboards, truck drivers and waitresses, snake-pits and dinosaurs but some crucial aspect of the American highway was missing. It dawned on me that I needed to make some photographs at night. So much of the experience of traveling our highways had to do with driving at night, listening to funky AM radio stations and pulling into towns that you could see coming twenty miles away because of all the neon. So, on the next highway trip, I decided to try making some photographs at night—something that I was not even sure was possible. In Deadwood, South Dakota I spotted a homely little motel at dusk, with a row of bare light bulbs and a neon sign. Through the window, I could see a neon-rimmed clock. Over the next hour, as it got dark, I shot a roll and a half of 120 film, bracketing my exposures. Two weeks later, back in Berkeley, I developed the film and was excited. 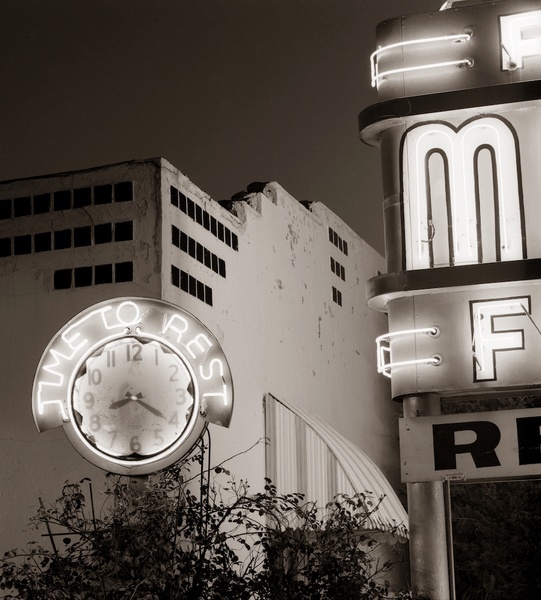 The photographs of that motel looked great! I picked one to print and it is in Diesels and Dinosaurs. I love the quality of light at dusk and in this photograph, the clock visible through the window tells me what time the photograph was made (8:20), and the second hand is blurred for about a second so it also tells me how long the exposure was. Ever since I have been very fond of photographs with clocks in them!" 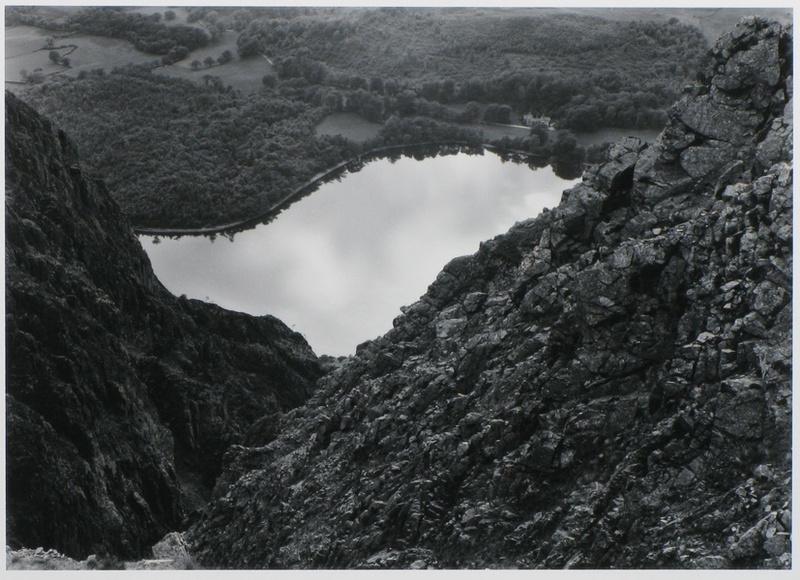 "Northern England, of course, is an entirely different world from Peru’s desert, and I made the picture of Wastwater over 20 years earlier than the desert picture. Nevertheless, the same outlook regarding vantage point is relevant, especially in an area where quickly changing weather can give one an unexpected insight at a particular spot, or render a successful picture impossible. I considered rather carefully the conditions that would keep me from getting drenched by rain as I hiked up the area near Scafell Pikes and Great Gable in the western sector of the Lake District and found that by prowling around the cliff above Wastwater, there were hints of light conditions and vantage points that might give me something special. It took some time, but the structure for the image gradually developed and finally became clear from a certain spot, much as a drawing might develop as one sketches in the landscape. In addition, I saw the shapes of the fields below to be of some importance, along with the role the elegant little house plays in the picture. Different elements can play integral parts in a successful landscape, but overall what we’re after, I suppose, is a view that can help us discover what Robert Adams suggests is the 'significance of a place.' Hopefully, that is open to as many interpretations as there are viewers of the picture." Northern New Mexico and Santa Fe is home to a vast, varied and thriving artist community. 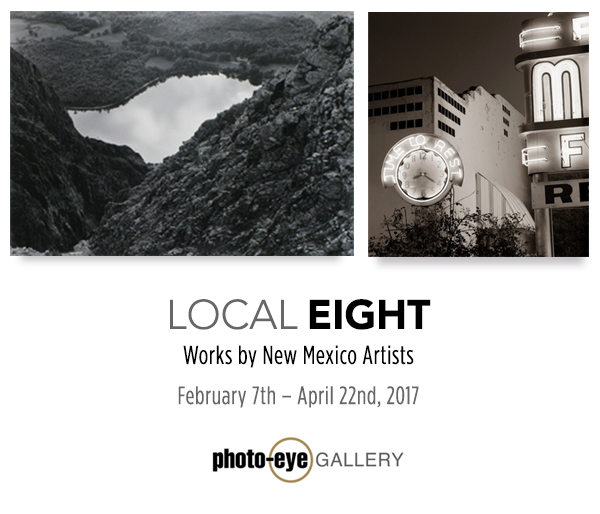 Local Eight is a group show focused on the diversity of style represented by eight area photographers exhibiting wide-ranging conceptual and material practices. The artist excerpts from this post were originally authored by photo-eye Gallery as promotional content during solo exhibitions for Fitch and Ranney.